Veggie Straws - A Tasty Snack for sure, but are they Healthy? I have knocked this product down a notch because I know longer believe sunflower oil is a healthy oil. For the most part, I try to avoid industrial seed oils. I would still prefer sunflower to canola. However, if you look at the ingredients, you might find that sunflower oil and canola oil are used interchangeably. I will avoid Veggie Straws until they wise up and start cooking them in coconut oil , lard , or beef tallow . Do they Taste too Good to be Healthy? Mark Veggie Straws down in my never ending search for healthy delicious snacks. I often find so-called healthy snacks taste more healthy than delicious. The ironic thing is that the less delicious they taste the more suspicious I become about how ‘healthy’ they really are. If you’re as old or older than me, you remember how much better McDonald’s French Fries tasted when they were deep fried in Beef Tallow . Unfortunately, our nation’s health experts came up with the mistaken notion that saturated fats caused heart disease and flavorful healthy eating have never been one in the same. These very same nutrition geniuses that told us saturated fats and cholesterol were going to kill us were the same ones who spurned the invention of the one thing that really is dangerous to eat: Trans-Fats. When McDonald’s started cooking their French fries in vegetable oils they not only tasted worse, but it turns out they weren’t so healthy after all. In fact, they were loaded with these deadly trans-fats. So, now we have McDonald’s French Fries cooked in Canola or some other oil that supposedly is void of any trans fats OR saturated fats. Well, I’m here to tell ya – it still tastes fishy to me, and I mean that literally. If you’ve ever tasted any type of oily, crisp snack and wondered what that fishy taste is, you can be sure it’s the result of the canola and vegetable oils which are being used in place of saturated fats. I once watched a potato chip taste test where an entire audience rated one product, “dead-last” because it tasted like fish oil . The culprit was canola oil. The winner of the taste test was the product that was cooked in sunflower oil. There is a reason our grandparents, great grand parents and beyond, used meat fats for cooking oil. It tastes better, it cooks better and it really IS healthier for you. I no longer rely on what is considered to be ‘healthy’. I rely on my taste buds. What tastes natural and good to me, is what I consider healthy. I stay away from fake-oil fried chips and I wish so badly that the burger joints would start making their fries the old way again. As I discussed earlier in my article, “How To Lower Cholesterol Fears”, this whole notion about dietary fast, cholesterol and heart disease is a dangerous and unfortunate myth. Does anyone think the nation has lost weight since the low-fat diet became popular? Garden Veggie Straws really do taste good and they are fun to eat. These light crunchy snacks are made from real vegetables like carrots, spinach and potatoes. I guess you could compare their shape and crunch somewhat to Cheetos, but they are hollow inside – thus the reason they are called, Veggie Straws. They are made from whole grains (corn flour, rice flour, oat flour), sea salt, sugar, salt, baking soda… but one problem; it has the dreaded canola oil. This may be the first time that I’ve enjoyed a snack made with canola oil. My conclusion is that the oil must be light and sparse enough that it doesn’t overwhelm the flavor with that fishy taste of other snacks cooked with canola. Obviously, one of the reasons Garden-Brand Veggie Straws taste so good is that they are made with Sunflower Oil instead of Canola Oil, unlike some of the other inferior products that call themselves, veggie straws. . My favorite equation: Better Taste = Healthier is proven true once again. When I’m eager for a snack, the fat is part of what my body is craving and there just is no substitute for that. Why do we insist on redefining the healthy snack? Since society began this perverse quest to take fat out of our diets, the result has been snacks which are less satisfying and people that are fatter, more obsessed and paranoid about eating the natural food our bodies need. 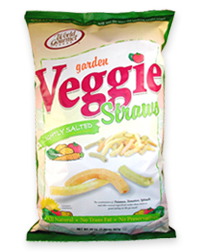 Veggie Straws by Garden is a not-so-healthy snack due to the commercial seed oils, but they sure do taste good. The Veggie Tale is that not all Veggie Straws are created equal. I’ve looked at some of the other products called, Veggie Straws and have duly noted that they contain the evil villain, Canola Oil rather than Sunflower Oil. I fully endorse Garden Veggie Straws (You can buy them at Amazon ) as a slightly unhealthy, tasty snack. They are low on calories, have a reasonable amount of fiber and are just crunchy and salty enough to solve your craving between meals. What is your rating on Veggie Straws? Oh my goodness, these are amazing! 130 calories in a significant portion size and so delicious! Um, yeah, these aren’t healthy, sorry to tell you. They’re essentially baked potato chips with powdered veggies. 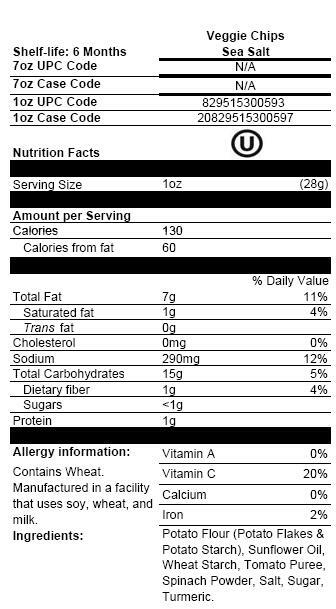 Seriously, look at the nutritional content and notice the lack of fibre. The only truly healthy snacks are vegetables, whole. Thanks a lot, Bob. You’re quite the Party Pooper. Telling us that one of the snacks we know and love isn’t healthy. I think perhaps I over-stated the point, here. I don’t consider a healthy snack to be one that replaces your daily nutrition. It’s what is NOT in Veggie Straws that makes them healthy as snacks go. It’s not full of the deadly transfats and other oils that make so-called healthy snacks so unhealthy. Besides, anyone trying to get their daily fiber from snacks is not thinking right. A lack of fiber in a snack does not make it ‘unhealthy’ an unhealthy snack. Snacks that don’t include harmful oils and other bad ingredients are ‘healthy’ in my book as long as you don’t consider them part of your so-called, ‘healthy’ diet. It’s not what they put IN a snack that makes it healthy. It’s what doesn’t go into the snack. Veggie Straws are a healthy snack – as snacks go, that is. I do like these veggie straws – and being on a gluten-free diet, they provide that once in a while slightly salty crunch I’m craving. But for some reason, I often have a minor stomach ache after eating these. Not sure what the issue is… but certainly a better alternative to anyone who likes regular potato chips, in my opinion. I get a stomach ache too! Every time I eat Veggie Straws, I get stomach pains, and they don’t go away until I have gone to the bathroom. I can’t eat these anymore! My hunch is that it is the fake oils these snacks are made with. I long for the day when we once and for all say goodbye to fake oils like Canola. The world was much healthier with saturated fats like Palm oil. May we finally come to our senses again and say goodbye to the harmful, low-fat diet! This kid at school had some a lil while ago and i didn’t want to try them (they didn’t sound appealing plus I hated the kid). But just recently my best friend brought some and i tried em, they’re actually really goood! So I plan on buying some next time i go to the store. I LOVE potato chips, but my parents don’t like me eating them (for obvious reasons), so maybe these will be the healthy replacement I am looking for. Great review. These are a really good replacement for greasy potato chips. I love the sweet BBQ flavor they have now — so good!! we just got these at Costco and we LOVE them!!!! My kids love them and my three year old actually asks for them. These will stay on our grocery list for a long time!!!! @ Krista, I get a stomach ache as well…..maybe I EAT too many at one time! Eating them now, so we’ll see how the tummy feels afterwards….Great snack, I feel better afterwards, compared to eating cheetos! I will tell you that I ate these the other day and got a slight stomach upset too. The ingredients on the bag do not have any gluten listed, HOWEVER, if you look on the outside of the box, it says Wheat Flour for each of the flavors in the CostCo package. Wonder if there is or is not wheat flour in there. Would make sense with the stomach issues. Can anybody verify whether there is wheat flour in the product? I don’t believe sodium is bad for the majority of us and natural fat is certainly not a problem- it’s those vegetable oils and fake fats that I would avoid. Generally, I consider anything that is labeled as ‘low-fat’ to be unhealthy, not vice versa. More and more people are thankfully, starting to recognize the Fat and Cholesterol Fraud. As for protein, I could care less about that in a snack. I get my protein from meals. Well Clint, we all have our books. I looked up your recommendation on Amazon and it does seem to have some good advise about restructuring our disastrous age-old food pyramid which is too full of carbs and sugars. On the other hand, if this author thinks saturated fats are unhealthy, I have no interest in reading it. There have been millions of books that have claimed that very same thing and none of it is based on good science. We all might have opinions on what is considered healthy and what is considered “not” healthy. The idea that fat and cholesterol from meat are “unhealthy” is simply not supported at all by science. Books that think vegetable oils are healthy are too numerous to count and all based on the wrong premise that saturated fats clog up our arteries. There is no statistical science to back this up. I love them. If I could eat the entire jumbo bag i would hahaha. They are a great replacement from regular greasey chips and all the other chip style snacks. They are hard to stop eating. Veggie Straws just have such a nice, light crunch. They are really fun to snack on. I have celiac and I got very sick from them. I like the taste, but I suspect they do have gluten in them. The way gluten affects me personally is canker sores in my mouth and joint pain. I bought a bag of these on the weekend and 2 days after eating some (not the whole bag but enough) I have two canker sores on the inside of my right cheek and one on my tongue. The bag says they are produced in a facility where they process wheat and soy so I think there is enough exposure to affect someone who has a gluten intolerance. Great points on the gluten concerns with Veggie Straws. This is the kind if information that makes blog articles like these infinitely more useful. Thanks for sharing. I am having stomach problems, too, after eating Veggie Straws. Sad, because I love them! My son and I also have stomach problems after eating these. Will have to throw out even though they taste soooo good. I’m ok with gluten and most food, but my sister is not, she has a lot of dietary restrictions. She eats these often and her stomach is fine with them, but for some unknown reason they always give me a stomach ache, even when I only have a small handfull. They are tasty and would be a good substitute for regular potato chips, but the stomach ache is not worth saving a few calories.